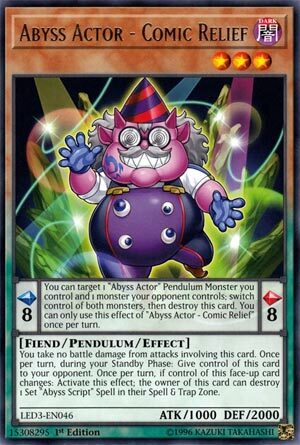 Pendulum Effect – You can target 1 “Abyss Actor” Pendulum Monster you control and 1 monster your opponent controls; switch control of both monsters, then destroy this card. You can only use this effect of “Abyss Actor – Comic Relief” once per turn. Monster Effect – You take no battle damage from attacks involving this card. Once per turn, during your Standby Phase: Give control of this card to your opponent. Once per turn, if control of this face-up card changes: Activate this effect; the owner of this card can destroy 1 Set “Abyss Script” Spell in their Spell & Trap Zone. We end week 2 off like we ended week 1 off, with an Abyss Actor card, this time it is Abyss Actor – Comic Relief. Comic Relief as a Pendulum Scale is a Scale 8 which is a good high scale since only one Abyss Actor monster is Level 8 while the rest are Level 7 or lower. While in the Pendulum Zone, you can target one Abyss Actor Pendulum Monster you control and one monster your opponent controls and switch control of the both of them and then destroy this card, this is a hard once per turn effect. Swapping something weak for something strong is a great option, but you can give your opponent Wild Hope and then you destroy it to get a search, or give your opponent another Comic Relief for a reason I’ll specify later. Nice option for a Creature Swap effect without having to play Creature Swap, and you get to pick what you take. Comic Relief as a monster is a Level 3 DARK Fiend with 1000 ATK and 2000 DEF. ATK is meh for Level 3, but DEF is great, being Level 3 is easy to Pendulum Summon in Abyss Actors since your low scale at the highest will probably be a 2, DARK is great and Fiend is good. You take no battle damage from attacks involving this card, which is nice to have cause taking damage is rarely ever good, and Abyss Actors isn’t really a case where it is good. Once per turn, during your Standby Phase, you give control of this card to your opponent, which is useful for its other effect. If control of this card changes, the owner of this card (you) can destroy 1 set Abyss Script card they control. All the Abyss Scripts have powerful effects when destroyed while set and I don’t want to go over all of them cause they are so plentiful, but trust me they are powerful. Pulling off this effect of Comic Relief can almost win you the duel. A negative is that I believe Abyss Scripts have to be destroyed by cards your opponent controls, so it isn’t useful when your opponent has to give this back to you. With that said, Comic Relief is a good card in Abyss Actors for triggering your Abyss Scripts or getting something strong in return for something like Wild Hope or Comic Relief. Art: 3.75/5 We got ourselves a comedian here, guys. Abyss Actor-Comic Relief closes week 2, just as we had an Abyss Actor to close last week. Level 3 with 1000 attack and 2000 defense are actually rather good on the stat scale. Fiend and Dark are well supported also, and being an 8 on the Pendulum Scale is a big bonus here too folks. The Monster Effect keeps you from taking Battle Damage from Battles involving this card (always good) and has a built in effect to that of Creature Swap, to give one of your Abyss cards to your opponent once per turn, and get something in exchange. Interesting effect to start, but going for something strong, and a shot at doing Damage with something stolen (or Tributing, Special Summoning whatever way you choose from the Extra Deck) this opens many possibilities. Getting to destroy a Set Abyss Script Magic or Trap card set in the Magic/Trap zone is very good too. It helps add speed to your Deck in order to pull off other combos, and you can, in theory, continue to swap the Monsters back and forth and continue to destroy these cards and reap the benefits there of. (The arsenal of these cards is loaded and lots can be done…might have to write an article about this). It’s a layered, multipurpose, combo oriented card, but not quite as quick as you might like. No real downsides though, a nice card for the Deck, no question. Art: 3.75/5 The eyes in the stomach/pants do fairly creep me out. I do enjoy all the background color, as I did last week. Sorta cosmic, and I still kinda feel a disco vibe here, given the attire as well.